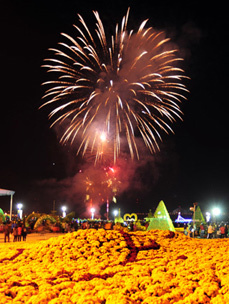 Fireworks light up the sky on the eve of the Chrysanthemum Festival in Masan on Thursday. Changwon in South Gyeongsang Province is holding its largest-ever chrysanthemum festival, with over 90,500 flowers on display and a whopping 670,000 stalks adorning the city as a whole. The festival began last Thursday and runs until Sunday. 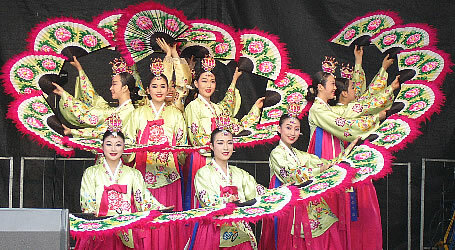 A ceremony held to fete the opening of the festival at Masan Port featured Korean traditional music and dancing as well as a K-pop concert and a fireworks display above the sea. Entry is free throughout the festival, which treats visitors to themed art made from chrysanthemums. Highlights include a Pyramid and Sphinx, and two ancient pagodas from the Shilla Kingdom. A range of events have been organized to entertain visitors including music concerts and photo contests. 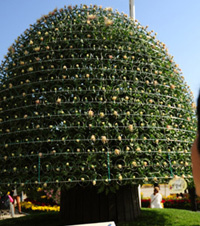 However, one of the biggest draws has proven to be a single stem containing 1,408 buds. The cultivation of this remarkable flower means the festival has beaten its own Guinness World Record, which it first set in 2009 by having 1,315 flowers bloom from a single chrysanthemum. The new record was made possible by using the latest botanical technologies, according to a researcher with the city's agricultural center. "For the past 16 months, over 300 experts have taken great care to see this project bear fruit," he said. 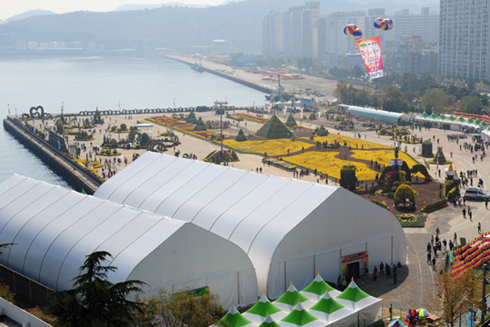 Some 60 booths have been put up at the event venue to promote and sell chrysanthemum-related products, while flower designers are showing off their artistry and skills in a contest. "We hope many people visit the festival to enjoy the fall while appreciating the chrysanthemums displayed here," said Cho Ki-ho, the city's vice mayor. Changwon is striving to improve all of the festivals it hosts, including its signature cherry blossom festival in Jinhae in April, to entertain its 1.1 million local residents and draw more people from other parts of the country. Last year's chrysanthemum festival drew 1.35 million visitors, over half of whom came from outside the city. Recognized for its contribution to the regional economy, it has been named one of the country's leading festivals by the Ministry of Culture, Sports and Tourism for the second straight year.